Surrounding the American Museum of Natural History, the Theodore Roosevelt Park stretches from 77th to 81st Streets between Central Park West and Columbus Avenue. For years, the city has fenced off its green space, not allowing park visitors to touch the lawns. 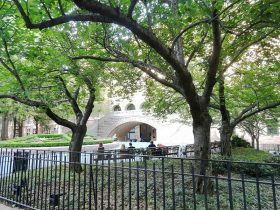 But this summer, as part of a pilot program, the city’s parks department will open two lawns in the Upper West Side park, according to the West Side Rag. From Memorial Day Weekend until September 30, the Northwest and Southwest Lawns will open to the public, officials announced at a community board meeting. 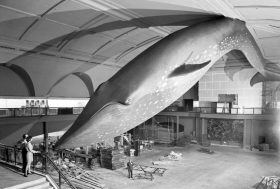 Back in 1968, the staff and contractors at the American Museum of Natural History got to constructing, mounting, and finally hanging the 94-foot fiberglass-and-polyurethane blue whale model that’s become an icon of the museum. Though the hulking whale looks like it’s been hanging from the Hall of Ocean Life ceilings since the museum’s opening, it’s actually the second version of the installation. According to Slate, the museum made the decision in the early 1960s to overhaul a paper-mâché model hung in the early 20th century because it looked outdated. The replacement was set to be nothing less than dramatic: a display to “create the illusion of having joined the whale in its own domain,” as As Alfred E. Parr, oceanographer and past director of the AMNH, wrote at the time. The holidays turn New York City into a bright, illuminated wonderland that even the biggest Scrooge among us can enjoy. 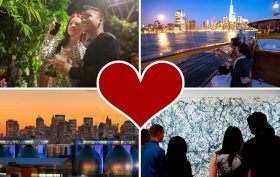 While there are plenty of events to choose from, like alternative holiday markets and glittering art installations, many of these activities can be jampacked with tourists. For those looking to learn more about their own holiday traditions, or understand others, there are lots of low-key, educational events perfect for history buffs looking for a quieter holiday experience. 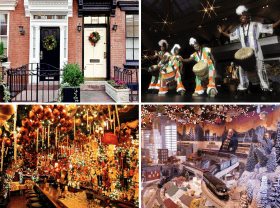 Ahead, check out 6sqft’s guide to the best holiday events in New York City that come with a historical twist, from Christmas to Hanukkah to Kwanzaa. Conceptual rendering of the south entrance to the new Allison and Roberto Mignone Halls of Gems and Minerals, from the Arthur Ross Hall of Meteorites. 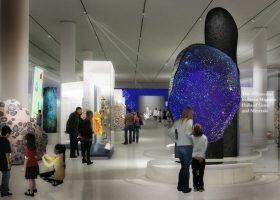 Visitors will be greeted by 9- and 12-foot amethyst geodes. Courtesy of Ralph Appelbaum Associates. 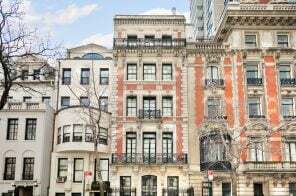 The giant blue whale and equally massive dinos might get all the glory at the American Museum of Natural History, but a new acquisition is bringing another exhibit into the extra-large club. This morning, the institution unveiled a 12-foot-tall, 9,000+ pound amethyst geode from Uruguay (one of the largest in the world) that will anchor its all-new Halls of Gems and Minerals. 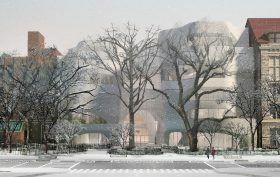 Ralph Appelbaum Associates is handling the renovation of the 11,000-square-foot space, which is being designed in anticipation of AMNH’s upcoming $340 million expansion by starchitect Jeanne Gang. 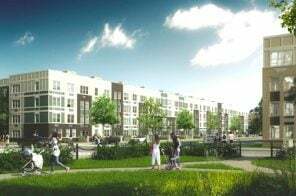 The Halls previously ended in a cul-de-sac but the new Halls will feature a “stunning Crystalline Pass” to connect to Studio Gang’s 235,000-square-foot Richard Gilder Center for Science, Education and Innovation. 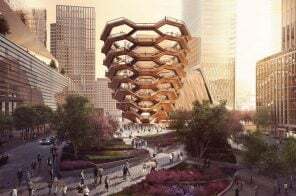 After the architects at Studio Gang tweaked their proposal for the American Museum of Natural History expansion to preserve more public parkland out front, the Landmarks Preservation Commission unanimously approved the plans in October. 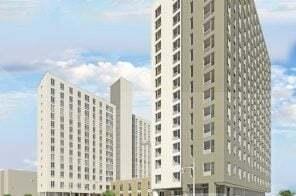 And now that things are moving ahead, and the price has jumped from $325 to $340 million, the institution shared new details about how the 235,000-square-foot Richard Gilder Center for Science, Education and Innovation will operate. 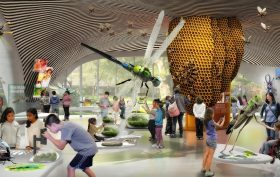 The update comes with a fresh set of interior renderings, which include views of the Butterfly Vivarium, Insectarium, and other educational spaces. 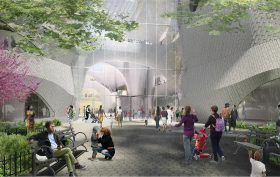 After revising its expansion plan last month to preserve more public parkland, the American Museum of Natural History had its day in front of the Landmarks Preservation Commission yesterday, and as DNAinfo reports, the agency lauded the plan for a new Richard Gilder Center for Science, Education and Innovation, with chairwoman Meenakshi Srinivasan referring to it as a “stunning piece of architecture” and an “absolutely wonderful addition.” In making their determination, the Commission was presented with a slew of new renderings, which show the $325 million, Jeanne Gang-designed project from various angles, as well as new views of the surrounding parkland.